BEST WISHES TO ALL IHSA RIDERS FOR A SUCCESSFUL SCHOOL YEAR AND SHOW SEASON! 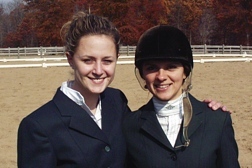 The Intercollegiate Horse Show Association (IHSA) was established in 1967 at Fairleigh Dickinson University by Robert Cacchione and John Fritz. The purpose of the IHSA is to promote competition for riders of any skill level regardless of financial status. Students compete individually and as teams members at both Regional and National levels. 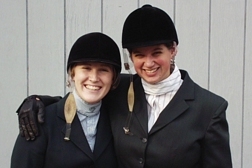 For all who take part, these IHSA competitions develop sportsmanship, team enthusiasm and horsemanship. The IHSA's competitions are affordable because individual colleges host each event and provide the horses. However, this is not the only unique aspect of IHSA competitions. Not only are riders not allowed to use their own horses, but personal tack and schooling/warm ups are not permitted. Horses and riders are paired up randomly by drawing. This enables riders to compete on an even keel and truly test their horsemanship ability. Levels range from beginner walk-trot through advanced open equitation competition. At the more advanced levels, competition includes jumping as well as flat work. Riders advance through the levels by accumulating points at the horse shows. First place is worth 7 points, second place is worth 5, third is 4 points, fourth is worth 3 point and so on. Once 35 points have been accumulated, the rider advances to the next level. 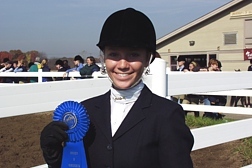 Once riders qualify at the horse shows, winners compete at the Regional Finals. The top three winners from that competition go on to the Zone Finals. The best two individuals from the Zone Finals progress to the National Championships held each year in May. The national high point hunt seat rider is awarded the USEF/Cacchione Cup. In addition to qualifying individual riders for Nationals, each team strives to be the high point college representing the region at the National Horse Show. This is accomplished in the same manner as individual competitions. However, the coach of each college designates the "point rider" in each division. At this time, the "point rider" is not only competing for themselves but they are representing the college as well. Like individual competition, each regional champion college competes for the zone champion college title. From there, the top two teams compete at Nationals. The national champion college is awarded the Collegiate Cup. The IHSA is a recognized member of the United States Equestrian Federation (USEF) and the American Quarter Horse Association (AQHA). Because of this, the IHSA is actively involved with the top professionals in the industry, and all horse shows are judged by USEF/AQHA recognized officials. For additional information, visit the IHSA website at www.ihsainc.com. "Hold yourself responsible for a higher standard than anyone expects of you. Never excuse yourself. Never pity yourself. Be a hard master to yourself - and be lenient to everybody else."